AtwoodFest comes back to Madison’s east side on July 25-26 and organizers have put together an amazing list of activities including the Eastside Eats Raffle, Little Free Library community art project, more crafts and food vendors, and even a parade to kick it all off called “Convergence”. A new website was launched at AtwoodFest.com that is optimized for a smartphone. Everything, including stage schedules, can be accessed with your thumb. Just click the yellow button at top right. Click on an artist’s name in the schedule and you’ll be taken to a profile page that has pictures, video, audio, descriptions, links and more. You can easily have your beer in one hand and AtwoodFest in the other! The Harmony Bar Stage presented by Maximum Ink and Alchemy Cafe Stage presented by Max Ink Radio will feature blues, funk, rock, country, hip-hop, reggae, disco, and indie artists from Nashville, Chicago, Milwaukee, Minneapolis, Boston, Sturgeon Bay, as well as some of the best Madison based artists. The KidsFest stage will feature acts that will appeal to both kids and adults alike. SheShe - SHESHE is a contemporary folk-rock band featuring bold ensemble vocals and driving improvisational instrumentals. SheShe is Julia McConahay (fiddle/vox), Shannon Callaway (drums), and Dana Perry (guitar/vox). SheShe made a stunning and very well received cameo appearance at AtwoodFest 2014 filling in for a band facing a late arrival. Owen Mays and the Last Calls - These traditional American honky-tonkers just arrived home after a spring European tour. 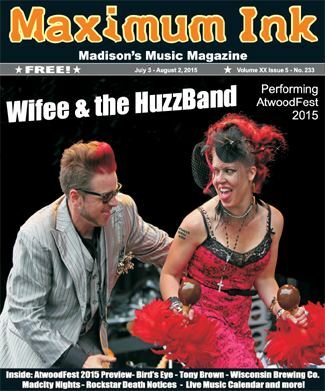 AtwoodFest will be the band’s first Madison show since wowing audiences from Norway to Turkey. Tallan Noble Latz - In his “short” yet growing career, this 15 year old power blues sensation from Elkhorn, Wisconsin has traded licks with legendary guitarists including Lonnie Brooks and Joe Bonamassa. At the age of 8, he played on stage with Wisconsin’s own Les Paul. Gabe Burdulis Band - Gabe and his band won the Wisconsin based Launchpad award (a Les Paul Foundation award for state high school students) two years in a row. After appearing on the cover of Maximum Ink music magazine, Gabe moved to Nashville, where he lives now, to take a shot the music business. Simo - A power blues trio from Nashville, Tennessee, SIMO fuses the improvisational brilliance of jazz, the gritty power of rock, and the soulfulness of blues to create a transcendent live experience. From Bonnaroo to Mountain Jam, Simo has been making a name on the national circuit. Lucas Cates Band - The reformation of Lucas’ band is complete and after releasing a new album in the spring, the band is only playing select shows, making the AtwoodFest appearance a delight. Lucas’ music covers a wide range of genres, including rock, pop, alt-country, folk, jazz, funk, R&B, jam and more. Dub Foundation - A Madison based reggae band and self described “Irie Super Heroes”, they feature everything from horns to dub engineers. Captain Smooth on vocals brings it back to real. Bird’s Eye - Quietly impressing audiences and building a following, Bird’s Eye fuses funk, jazz, and rock with a bit of hip-hop. This five piece band of talented musicians is fronted by MC Ra, who weaves a rhythmic tale between the keys, sax, funky bass, jazzy drums and even an occasional talk box on guitar! This is one of the hidden gems in the festival. Black Market Brass - A Minneapolis-based 9-piece band, they perform their own brand of originally composed Afrobeat/Afrofunk music, as well as authentic renditions of the classic 1970’s West African sound. Taking their cues from the godfathers, the band draws on complex polyrhythmic percussion, driving bass lines, dizzying guitar interplay, rolling keyboards, and room-commanding brass. The result is an eclectic blend of cool deep funk and driving Afrobeat grooves that will lure you to the dance floor and never let you leave. Eric Sommer - From Boston, Eric Sommer is beyond what people call a “hard working musician.” circling the country playing clubs and festivals year round. Eric is one of the finest free-form pickers anywhere, borrowing from Steve Howe, Merle Travis, and Doc Watson. His free-form guitar style utilizes an original and explosive fret approach using every fret on the neck and re-tuning on the fly, bending the neck and slapping the strings, sound holes, guitar tops and sides. But Eric also does more a wide variety of open tunings, a range of guitars and a collection of small, wonderfully obscure vintage guitar amps add to the presentation. Seeing him work these elements in a live show is something audiences remember. Eric opens AtwoodFest and it well be worth it to show up at noon! Wifee and the HuzzBand - Pulling from influences of old soul, Motown, 50’s-60’s rock and roll, R&B and some funk, this 10-piece band from Sturgeon Bay will fill your soul and shake your booty. Kitty CoopDeville and her “Huzzband” formed the band the night they were engaged at the Steel Bridge Songfest in Door County. Get ready for the New Vintage. The Congregation - This is an 8-piece horn-driven rock/blues/soul hybrid from Chicago that never disappoints on the live stage. Let’s have a “hallelujah” for The Congregation! Led by the strong and captivating vocal presence of Gina Bloom, this is a band that is equally comfortable slow burning a blues standard torch-singer number, or bumping and grinding their way through an Iggy & The Stooges cover. Be there to represent at Atwoodfest for the soulful grooves of The Congregation experience, in the sweet spot before VO5. VO5 - Madison’s disco super group, VO5 turns AtwoodFest into a street dance party every year bringing people of all ages to boogie down. As amazing as it is popular, VO5’s 11 piece 70’s disco group will once again close the festival on Saturday night. The Civil Engineers - Formed in 2012 by five friends hungry for a little something funky, The Civil Engineers are a high-intensity groove machine of funk, rock and soul. While Molly Ford’s breathtaking vocals float over head-noddin’ beats interweave with screamin’ organ and searing guitar. The band prides itself on raucous live shows complete with audience sing-alongs, dance-alongs, and more funk than you can lift with a bulldozer. The Big Payback - The Big Payback is an award-winning Funk/Rock/R&B band featuring the soulful vocals of Leah Isabel Tirado and a smoking horn section. The band’s hard-hitting originals and classic covers are guaranteed to get the crowd dancing, energizing them just as much as the musicians themselves. With an infectious appeal that cuts across generations, Payback is a party you won’t want to miss. The Sharrows - The Sharrows brand of music, “farm rock”, references their musical mecca, the rural barn studio where they practice and record. Their grungy folk vibe is driven by a steady bass drum thump accompanied by heavily picked bass lines, and a slashing cello, adding beef to their bluesy saunter. They are another hidden gem of the festival. Steely Dane - Madison’s All-Star tribute to the music of Steely Dan featuring 20 legends of the Madison music scene. Collaboration leaders Dave Adler keyboardist of the Gomers and, local jazz pianist Dave Stoler, front a band that features a list of musicians a mile long. Look for local stars Joey B. Banks, Biff Blumfumgagnge, Jay Moran, Alison Margaret, Freedy Johnston… just to name a few.